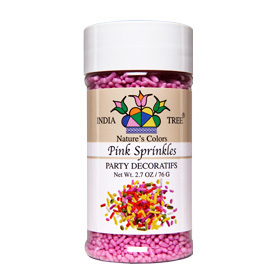 Add some fun to your baked goods with natural sprinkles! Excellent for decorating cookies, cakes, doughnuts, and cupcakes. Ingredients: Sugar, corn starch, palm oil & palm kernel oil, dextrin, soy lecithin, colored with beet juice, confectioner's glaze, carnauba wax.